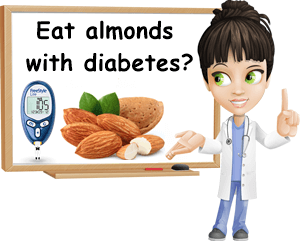 Can You Eat Almonds With Diabetes? Almonds are one of the best nuts you can eat with diabetes and the reason why they make a good choice is their dense nutritional profile that provides a range of benefits specifically for the metabolic condition. Some of the biggest benefits of almonds for diabetes include improved blood sugar and insulin control, healthier cholesterol profiles, better blood pressure numbers as well as minor benefits for skin, eyesight and nervous system. Eating almonds on a regular basis is good not only for weight control, but also actively supports weight loss by providing good nutrition that supports an active lifestyle. At the same time, because of their dense nutritional profile, particularly high energetic value, almonds are best eaten in moderation, whether you have diabetes or not. With diabetes, the main issue is weight gain. Almonds have about 580 kcal per 100 g and almost 50 g of fat. One oz of almonds, or 28.35 g, a quarter of 100 g or 23 kernels provides 164 kcal and over 14 g of fat – or about 18% of the average person’s daily reference value of fat intake. Eating too many almonds too often can easily encourage weight gain which is problematic for diabetics because it accentuates existing health issues. One big question everyone has about almonds and diabetes is: can you eat them every day with the condition? Technically, you can eat almonds every single day with diabetes, so long as intake is limited to amounts small enough that the energetic value you get from your intake is in accordance with your individual nutritional requirements. In other words, almonds are high-calorie and high-fat and need to be consumed in limited amounts in order to avoid weight gain which could accentuate diabetes complications such as insulin resistance or cardiovascular disease. At the same time, it’s considered desirable to enjoy as varied a diet as possible which would mean it’s actually a good idea to switch up your choice of nuts from time to time and, well, not eat almonds every single day. How many almonds should you eat per day with diabetes? With diabetes, there is no one-fit-all solution. People respond differently to various foods and combinations of foods, resulting in a range of glycemic and other effects for the same food or food pairings. Also, individual nutritional requirements differ from person to person which would mean that some diabetics can eat more of some foods at once, while others are better off eating less. In any case, intake of most foods is supposed to be reasonable. The same is true for almonds. A good portion size to start off with would be 1 oz, or 28.35 g or 23 kernels. Eating about 1 oz or 23 almonds a day (ideally not every single day forever) is a good way to make sure you get plenty of the benefits they have to offer, but without the side effects. Eating too many almonds a day every day for longer periods of time can lead to side effects such as weight gain and excess body fat, high LDL and triglyceride levels, high blood pressure, all of which complicate diabetes. The glycemic index (GI) is a scale that measures how fast the carbohydrates in a food raise blood sugar levels (during digestion, carbohydrates are broken down into their simplest form, sugar, which is then absorbed into the bloodstream, contributing to blood sugar levels). Below 55 is a low GI. Between 55-69 is a moderate GI. Between 70-100 is a high GI. Diabetics and anyone needing to control their blood sugar are advised to include in their diets foods with as low a GI as possible, as often as possible, to avoid hyperglycemic instances. The glycemic index for almonds is currently unknown. Some purport it to be 0, others estimate it to be around 15. However, what is known is that almonds are unlikely to affect blood sugar very much, seeing they are extremely high in fat and high protein compared to the carbohydrate content: almost 50 g of fat per 100 g of almonds and over 21 g of protein, but 21.55 g of carbohydrates. Whilst carbohydrates get digested quicker and contribute to blood sugar levels, fats and protein delay digestion and stomach emptying and, as a result, slow down the rate of sugar absorption into the bloodstream, offsetting the glycemic effects of the carbohydrates. It is reasonable to assume that almonds have a glycemic index value similar to that of other nuts. For example, cashews, which have 10 extra grams of carbohydrates and 6 less grams of fat per 100 g, have a glycemic index ranging from 21 to 27 (low). Peanuts, which have only about 16 g of carbohydrates (compared to 21.5 in almonds) and just as much fat (50 g of fat) per 100 g, have a glycemic index of only 14. It is thus reasonable to assume that almonds should be roughly around 20 on the glycemic index scale, similar to most other nuts. The glycemic load (GL) is a scale that measures how fast the carbohydrates in a serving of food raise blood sugar levels. Below 10 is a low GL. Between 11-19 is a moderate GL. Over 20 is a high GL. If you are diabetic or just need to keep your blood sugar in check, it is advisable to choose foods with as low a GL as possible, as often as possible. The glycemic load (GL) score is calculated based on the glycemic index (GI) so a food with a low GI is likely to have a low GL as well. The GL score is also calculated based on how much carbohydrates there are in a serving of a food, such as almonds. Given that the glycemic index of almonds is likely low and that a serving of 100 g has 21.55 g of carbs, a serving of 50 g less than 10.8 g of carbs while a 1 oz serving has as little as 6.11 g of carbs (but just as much protein and about double the fat), it is reasonable to assume that almonds glycemic load is fairly low. Further information will be added as soon as it becomes available. Do almonds raise blood sugar? Almonds have a significant carbohydrate content: 21.55 g of total carbohydrates per 100 g and 6.11 g of total carbohydrates per oz (the equivalent of 23 kernels). At the same time, they are ridiculously high in fat and high in protein (slightly more than double the fat and about just as much protein as carbs). Both fat and protein take longer to digest and, as such, slow down the rate of sugar absorption into the bloodstream. The glycemic effects of the fat and protein balance out the glycemic effects of the carbohydrates, preventing almonds from generating a significant rise in blood sugar levels. In other words, given their particular nutritional profile, almonds have rather minimal effects on blood sugar in diabetics and non-diabetics alike.